FlameShield™ 1500 vermiculite coated high bulk texturized fiberglass sleeve is a high temperature, heat and flame resistant thermal insulating sleeve that will withstand temperatures of up to 1500°F / 815°C continuous exposure. 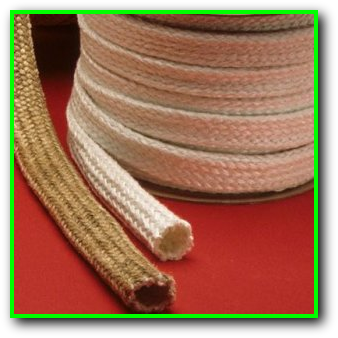 The base high temperature braided fiberglass sleeve is fabricated from high quality type E fiberglass that will not burn. The sleeve is then coated with a vermiculite dispersant. This material resists most acids and alkalis and is unaffected by most bleaches and solvents. It is highly flexible and conformable. The base fiber is manufactured to the specifications of ASTM D-578. Applications for this product include thermal insulation, protection of industrial wires, cables, hose (hydraulics), tube and pipe as well as affording personnel protection and energy savings. The vermiculite coating also adds abrasion resistance and anti-fray properties to the sleeve. This sleeve is tested and certified to meet ASTM E 162, ASTM E 662 and SMP 800-C for surface flammability, smoke and toxic gas generation.